The only Mexican food I knew growing up were the tacos my mother made, and they were awesome. Hers is one of those recipes the taste of which I have never been able to accurately recreate, and I helped her do everything but the frying. Mom would make hers with El Milagro corn tortillas that were shipped daily from Chicago. Mom was absolutely overjoyed when she reached into the box at our local Mexican food market and found the paper wrapped dozen to still be warm – that’s how fresh they would be. We never ate refried beans or rice or burritos or enchiladas – and Mom refused to try avocados Her story was that avocados were one of the highest calorie fruits, and her waistline could not afford to fall in love with another high calorie food. 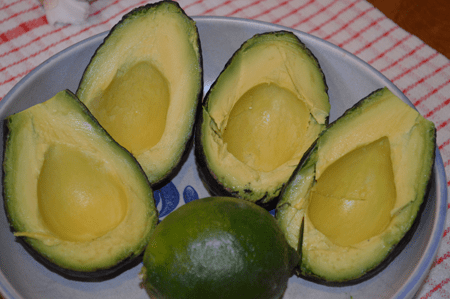 But now we know that avocados are an excellent source of monounsaturated fat, the good fat, the kind of fat that may actually help lower blood cholesterol levels. Ole! I learned to cook a variety of Mexican food from my ex-mother-in-law. Chicken enchiladas in mole, tostadas, tortillas, salsa, beans, rice, and guacamole. One regret I have is that she never taught me to make tamales. As the story goes, growing up in her family, the women would work long hours to make them, and the men would gobble them up as soon as they came out of the steamer. It was an all day endeavor. The women had a hard time keeping up, until they got wise and decided they would control the situation by not making them. Homemade tamales is still one of those dishes on my food bucket list. Carmen made guacamole for tostadas. We used it as a condiment to paste everything on top of tostadas, so the toppings wouldn’t fall off. Believe me, we had to use something, because our tostadas came fully loaded. 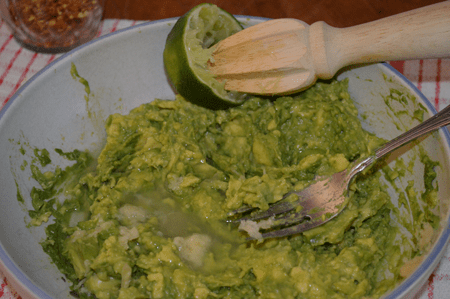 There are so many ways to enjoy guacamole! And I’ve had lots of versions, all of which I’ve loved, as would have dear Mom. The recipe I make most consistently is the one Carmen taught me over 30 years ago. But don’t be afraid to experiment with different flavors and ingredients. Avocados are so mild tasting that they can carry lots of goodies like crumbled crispy fried bacon, cilantro, fresh and finely chopped jalapenos, tomatoes, onions. And you don’t have to mash them. Lots of good cooks cut the flesh into little cubes and gently mix the other ingredients, so the avocados keep their shape. I’ve had great success buying fresh avocados at Costco. They’re large and reasonably priced. About a week ago, I got a bag of five lovely ones for $3.99. The fruit is usually rock hard, but you can put them in a paper bag on top of your refrigerator for a couple of days, and they’ll nicely ripen. Unless you’re in a market where ripened avocados are the readily available, you might want to plan a few days ahead of your dinner or party, so you’ll have pretty, soft fruit. Take 2-3 large, ripened avocados run a knife down the middle to halve them, and twist the fruit apart. You’ll find one large pit in one of the halves, and you can remove it by using a sharp butcher knife, gently chop the blade into the pit so the knife has a grip, and twist the pit out. But be careful! 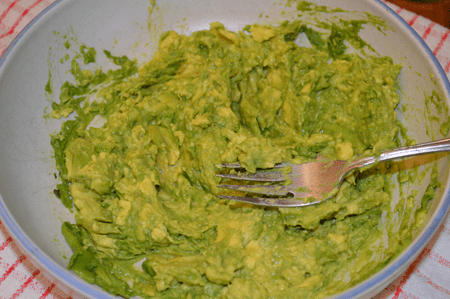 Scoop out the flesh using a large serving spoon into a shallow bowl, and mash the avocado with a fork. Leave some of the avocado in small chunks. Now, here’s were I stray a bit from the original recipe. Carmen used garlic salt to season at this point. And you can use garlic salt, granulated garlic, or, as in the case here, fresh garlic. Just beware that fresh garlic can have a strong flavor, so you should use whatever suits your fancy. Squeeze the juice of 1/2 lime over the avocado and garlic. Add 2 tablespoonsful of sour cream, 1 teaspoonful chopped fresh or jarred jalapenos, 1/4 to 1/2 teaspoonful crushed red pepper flakes, and salt and pepper to taste. Mix it all together, and transfer to a serving bowl. 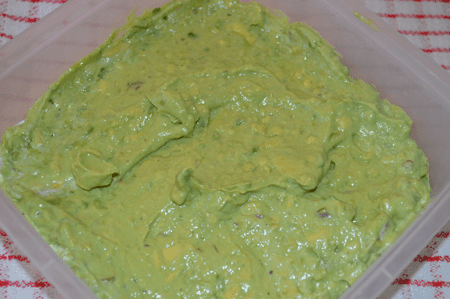 Place a piece of plastic wrap over the surface of the guacamole, and refrigerate to let the flavors develop. Let’s get out the chips! YUM!! It’s cool and creamy – has to be one of my favorite green things! Enjoy!!! Cut avocados in half. Remove pit. Scoop out flesh into a shallow bowl. 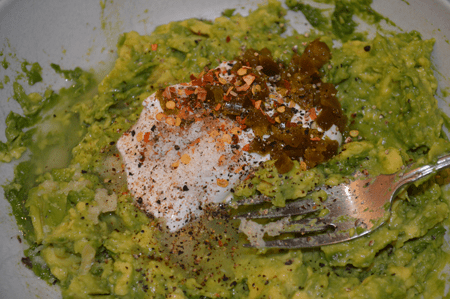 Mash with a fork, and leave some of the avocado in small chunks. Add minced garlic, garlic salt, or granulated garlic - whatever you're using. Add sour cream, jalapenos, crushed red pepper, lime juice, salt and pepper. Mix gently with a spatula until combined. 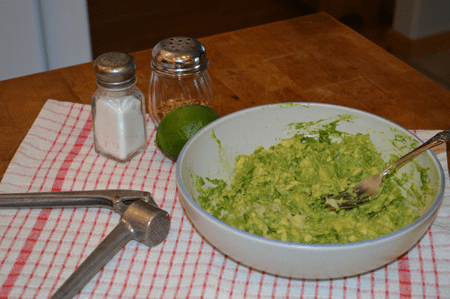 Put guacamole into serving bowl. Cover with plastic wrap that touches the surface of the guacamole to keep it from turning brown. Refrigerate for 45 minutes or so to allow flavors to develop. You can make lots of additions to the guacamole. Crumbled fried bacon, finely chopped onion or green onion, chopped tomato, finely chopped jalapeno or serrano chiles - depending on how hot you like it. Serve with tortilla chips or use as a condiment to tostadas.